Hakuho’s undefeated run in Osaka last month gave the yokozuna a 15th perfect championship and 42nd title overall. The veteran continues to cement his status as the greatest of all time, and has solidified his place on sumo’s Mount Rushmore alongside Raiden, Futabayama and Taiho. If those four are arguably the best men ever to put on a mawashi, who are the top women? 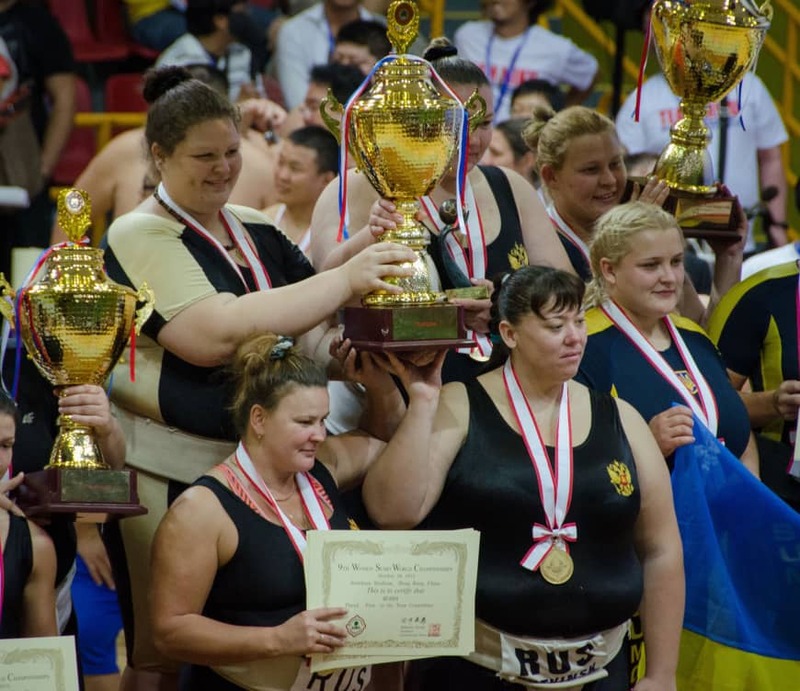 Although there is no professional women’s sumo, the amateur version of the sport has seen large growth over the past two decades. In that time Anna Zhigalova has been the most dominant figure in the ring. The Russian has rarely been off top spot on the podium and has taken gold at nine straight Sumo World Championships or World Games. The latter competition, unlike the SWC, allows athletes to compete in both the openweight division and one other weight class. The International Sumo Federation, citing the inability of most national governing bodies to fund two overseas trips in the same calendar year, uses the World Games as a de facto Sumo World Championships every four years. Zhigalova as a result has represented her country in both heavyweight and openweight at the 2009, 2013 and 2017 World Games, and taken gold in each division every time. So dominant has the veteran been, that in 2018 she was nominated (under her married name of Poliakova) for World Games’ athlete of the year. Add in the almost 50 domestic and continental-level golds Zhigalova has won, and it’s clear that the big Russian has dominated women’s sumo in a manner similar to that of Hakuho in the professional game. Zhigalova has always posed a unique challenge to opponents, as despite being 186-cm tall, she has good hip flexibility and solid technique, which allows her to regularly get morozashi (a double-inside grip). Staying low is a must when fighting Zhigalova, but the Russian has deceptive speed and if she gets her right hand on the mawashi, her powerful uwatenage (overarm throw) allows her to win even from awkward positions. At 37 years old however, Zhigalova’s time at the top is drawing to a close. While there doesn’t seem to be anyone on the horizon who will dominate the sport to the same extent, for the foreseeable future most, if not all, medals will likely continue to go to wrestlers from the big four nations — Russia, Ukraine, Japan and Mongolia. At the highest levels, women’s sumo suffers from the same lack of competitiveness as the men’s game. While the sport was granted full recognition by the International Olympic Committee last October, the gap in participation numbers — as well as medals won — between the top few countries and the rest is one of the barriers preventing sumo’s inclusion in the games. Progress is being made, however. It has to be remembered that the first Women’s Sumo World Championship was held less than 18 years ago, and it wasn’t until 2008 that there were enough wrestlers to hold a junior women’s tournament. The 2018 edition of the latter competition saw athletes from six countries medal, and the numbers taking part continues to increase. Events like last week’s International Women’s Tournament in Osaka now even manage to attract competitors from places like Thailand, Hong Kong and Taiwan, despite being just an invitational meet. Maki Okutomi of Nihon University, one of Japan’s best hopes for the future, downed veteran Miku Yamanaka, a former world championship silver medalist, in the final of the light heavyweight division. That 73-80-kg class was one of five new weight divisions implemented for the tournament. It reflects a move in amateur sumo toward an increase in weight classes — something that the larger number of athletes has necessitated. The 2019 World Championships, which will take place in Honolulu, will be the first to have a light heavyweight class for both men and women. For women, the change essentially boils down to the former middleweight (~80 kg) division being split into middle (65-73 kg) and light heavy (73-80 kg) classes. That adds three new medals to the tournament, which will reward more athletes, and in theory increase motivation and participation numbers. For Japanese women in particular the change is a welcome one. Rie Tsuhiji in 2002 (openweight) and Yuka Ueta in 2012 (heavyweight) are Japan’s only gold medalists in the two biggest divisions. Even had Zhigalova not dominated the sport over the past 15 years, it’s likely that most of the medals in the heavyweight and openweight classes would have gone to other Russian or Ukrainian wrestlers. Despite a relatively larger pool of athletes, Japan just doesn’t produce a lot of top class wrestlers in the over 80-kg division and even fewer that can match the power and size of the 150-kg plus Eastern Europeans. Still, just as with Hakuho and the professional game, women’s sumo, post-Zhigalova, figures to be a lot more competitive and open in the years to come. While she has never gotten anything like the same level of attention or received even a fraction of the column inches that Hakuho has, Zhigalova’s achievements certainly have placed her among the greatest ever to step in the ring.